In anticipation of the upcoming show - OUT OF HAND (Love in the dark) Xclusivegists Blog interviewed the host of the show - Mr. ChimeFrancis. 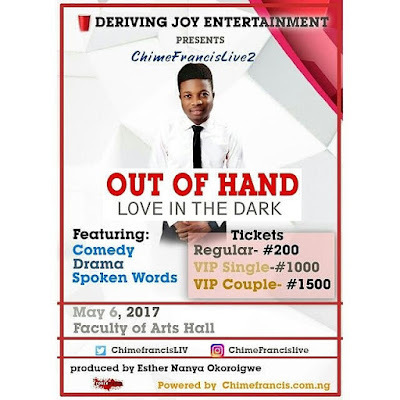 XCLUSIVE: So Mr. ChimeFrancis, What is love in the dark all about? MC Chimefrancis: Love in the dark is the theme that was picked for this year's edition of #CHIMEFRANCISLIVE on stage. MC Chimefrancis: Yeah! Entertainment as we know evolves and we at deriving joy entertainment always want to keep improving; to that effect we decided to spice the event with not just comedy, we also incorporated other genres of entertainment. To give more live to this year's edition. XCLUSIVE: Nice, do you think all aspects of the show will be represented well as the time limit or the show is short? MC Chimefrancis: Yes! Every aspect will be touched. The event will begin at exactly 4pm. There will be no African Time. XCLUSIVE: Alright, Have all personalities for the event confirmed their presence? MC Chimefrancis: Yes, They have all confirmed they will be in attendance to perform. XCLUSIVE: Nice, How is the ticket sales and bookings going? MC Chimefrancis: The tickets for the event has been on sale for a week now. It is being sold for Regular 200, VIP single 1000, and VIP couple 1500. XCLUSIVE: So you're going to give the audience a good run of their money? XCLUSIVE: Of course, please give a quick recap of the show plus date, time and venue. MC Chimefrancis: OK like I said earlier, #CHIMEFRANCISLIVE2 Is an evening of COMEDY, DRAMA,DANCE, And SPOKEN WORD. It is going down at FASA Hall On The 6th of May, 2017 by 4pm prompt. Brought to you from the producers of cupid stories & ROOM SERIES; Deriving Joy Entertainment. 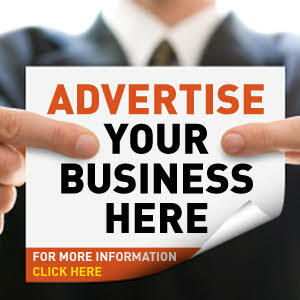 XCLUSIVE: Are you going to premier any of your skits?. XCLUSIVE: Finally, What do you have to say to the audience that has much anticipation for the show? XCLUSIVE : Thank you so much for your time. MC Chimefrancis: Thank you too.